Cause of her death was Cancer in Bladder/Uremia. Pauline, age 3, with father Henry, age 36, mother Sophia, age 26, an d siblings Sophia, age 4, Mary, age 2, and Claude, age 9 months, wit h lodgers Mary A. McGilvery, age 19, and Archibald McGilvery, age 1. Pauline, age 12, with father Henry, age 45, mother Sophia, age 35, an d siblings Sophia, age 14, Mary, age 11, Fritz, age 7, James, age 6, T homas W., age 4, and Carl, age 1. Pauline, age 27, with husband Melville, age 25, with daughter Jessie ( ? ), age 2 months. Pauline, age 30, with husband Melville, age 39, and children Bessie, a ge 9, Melville, age 8, Olive, age 3, and Ruth, age 6 months. 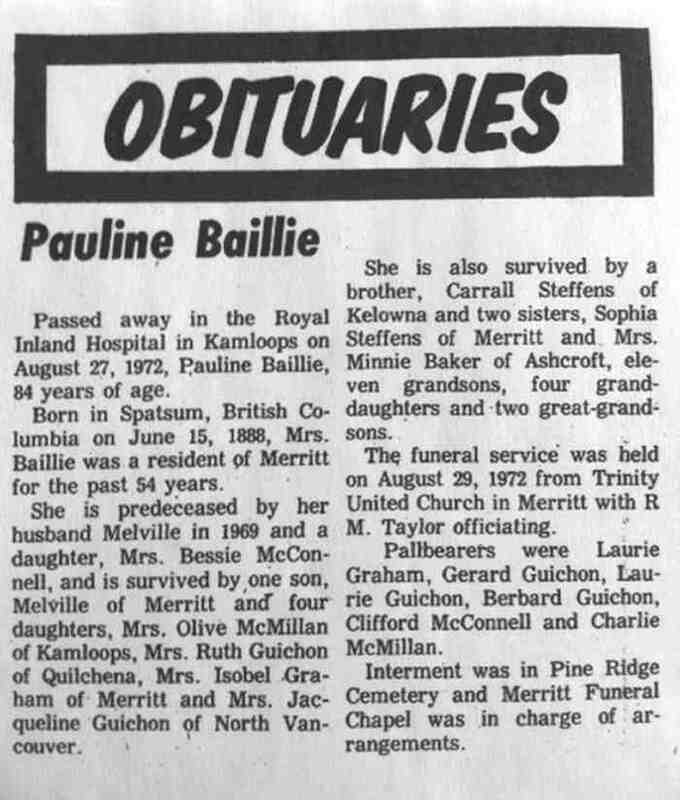 Passed away in the Royal Inland Hospital in Kamloops on Augus t 27, 1972, Pauline Baillie, 84 years of age. Born in Spatsum, British Co-lumbia on June 15, 1888, Mrs. Baillie wa s a resident of Merritt for the past 54 years. She is also survived by a brother, Carrall Steffens of Kelowna and tw o sisters, Sophia Steffens of Merritt and Mrs. Minnie Baker of Ashcrof t, ele-ven grandsons, four grand-daughters and-two great-grand-sons. The funeral service was field on August 29, 1972 from Trinity United C hurch in Merritt with R M. Taylor officiating. Pallbearers were Laurie Graham, Gerard Guichon, Lau-rie Guichon, Be rnard Guichon, Clifford McConnell and Charlie McMillan. Interment was in Pine Ridge Cemetery and Merritt Funeral Chapel was i n charge of ar-rangements. Pauline married Melville Charles Baillie, son of John Baillie and Jane Melville, on 20 Dec 1909 in Ashcroft, British Columbia, Canada 1289.,1290 (Melville Charles Baillie was born on 15 Oct 1880 in Earltown, Nova Scotia, Canada,1295 died on 13 Jul 1969 in Kamloops, British Columbia, Canada 1289,1295 and was buried on 16 Jul 1969 in Merritt, British Columbia, Canada 1295.). The cause of his death was Bronchial Pneumonia/Cerebral Myocardial degeneration due to Arterial Sclerosis. The marriage took place at the residence of Mr. Fred Baker in Ashcroft , BC.